The result of love for the movies and years of collecting film posters, memorabilia and data, the three volumes of Platea In Piedi are regarded as the Italian Movie Production History Bible. The books cover the period between 1945, when Italian movie production first started at Cinecittà, to 1978. In addition to a wealth of superb reproductions of unique and rare film posters, original drawings and illustrations, handwritten musical scores, and previously unpublished private images of major Italian actors, directors and composers, the volumes offer detailed information about production costs, distribution, revenues, prizes won, and more. To find out more about the books, please visit cinemabaroni.com. 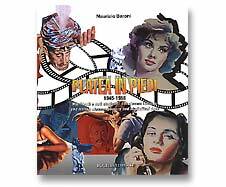 Platea In Piedi volumes 0, 1 and 2 are not distributed in the USA. You may, however, order the books directly from the author. Please note that the books are shipped from Italy.